You don’t realise how much something was missing from your life until you get it, and for me it was definitely a good set of Kitchen knives. Having used the same set since I moved into my flat without even sharpening them, it is safe to say they are not the sharpest or the best. I was given a set of Robert Welch Signature knives and on using them I was instantly wowed and realised how much of a difference quality makes! From the way the knives look, the ergonomic design, the style and strength of the blade and the handle shape, they were so much better than the knives I was using. I tested the knives out on different vegetables and they cut through them with such ease and makes life in the kitchen so much easier. The quality of knives, as well as the sharpness make a massive difference! For me, it was cutting through tomatoes. I am so used to cutting them with my old knives and the juice splattering everywhere and creating a mess. 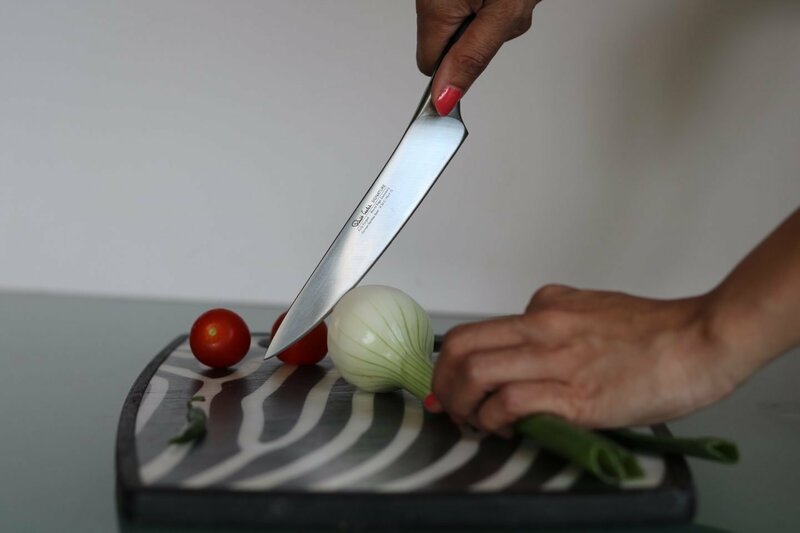 With the Robert Welch knife it sliced through effortlessly creating beautiful slices and absolutely no splattering anywhere. Same with radishes! Lovely thin discs of pretty vegetables! If you are thinking of purchasing a new set of knives I highly recommend the Robert Welch Signature knives. What’s even better is that to celebrate one million sales, Robert Welch are running a competition in which you could have the chance to win the very same knife block which I received and reviewed above. * This post was in collaboration with Robert Welch but all opinions and photos are my own. They are amazing knives!